“The War Games” (Episodes 6-10) / "“The War Games” (Episodes 6-10)" / "“The War Games” (Episodes 6-10)" / "“The War Games” (Episodes 6-10)" / "“The War Games” (Episodes 6-10)"
It's tempting to skip ahead and dive right into the final episode of "The War Games," since it casts the longest shadow over Doctor Who's future evolution. The War Lords may be in all 10 episodes of the story, but they never return to the series, and the Time Lords do—even now when they're all dead or missing, the Doctor's guilt and loneliness over their absence is a crucial element of his character. And just in the interest of keeping this relatively short, I'm not going to spend a lot of time on episodes six through nine, even though there's a lot of interest happening in that penultimate section of the serial, as the long arc of the War Zones story enters its final phase. As for the aliens—who never get an official name of their own, so let's just call them collectively the War Lords—it's interesting that they're not really very military, despite what their scheme might lead you to believe. The first couple War Lords we meet are very soldierly, of course, but Smythe and Von Weich seem to be the exception. Once we get to their base, it's all cold, clinical, nerdy scientists more suited to a lab than a battlefield—which maybe is why they made a laboratory that was also a bunch of battlefields. You might instead have expected people that looked more like GWAR or Conan the Barbarian, or maybe some kind of proto-Sontaran military organization. But even their supreme leader, the War Lord himself, turns out to be a little bearded guy with glasses—the kind of guy who orders other people into battle, not someone who'd do the fighting himself. Although his character comes on the scene too late to become a truly threatening villain or to have much direct interaction with the Doctor, forced instead to mediate the squabble between his two Chiefs and play defense against the inexorable base invasion, he's positioned as the story's Final Boss. Which is something of a trick on the part of the scriptwriters, since everything in this last half of the story is leading to the surprise of episode 10, that the War Lords aren't the Doctor's real problem. But he's well-played by Philip Madoc (who would later return as the monomaniacal mad scientist Solon in "The Brain of Morbius") as a rigorously self-controlled, icy master planner without a hint of bombast. Look at how Madoc plays the one moment when the War Lord does loses his cool, after the Time Lords use their psychic powers to force him to talk during the trial: He gives out a scream of pain, but then keeps his back to the camera as he collects himself, and carefully puts his glasses on again before turning back toward us, his face again a mask. It's too bad the War Lords never did return. I'll try not to go on about this at length, since it's a fairly obscure topic that has no clear resolution. In the end, you're free to make up your own mind, since there's just nothing definitive either way. (In the TV series, at least. Things gets murkier once you bring in ancillary material like novels and games, which is one reason I prefer to ignore that stuff. Playing connect-the-dots with continuity is fun for a while, but I have to draw the line somewhere.) But let's look at what little evidence there is, pro and con. 1) The Master and the War Chief were both co-creations of Terrance Dicks, co-writer of "The War Games" and script editor of "Terror of the Autons," which introduces the Master. This doesn't help clarify anything, though, since so far as I know Dicks never said anything definite that might connect the characters despite writing frequently about the Master and at least once more, in the novel Timewyrm: Exodus, about the War Chief. If anything, that's a big strike against the theory if the guy who invented them seems to think of them as different people. 2) They have a similar fashion sense, favoring dark high-collared jackets and facial hair. But that's superficial detail, and again, it doesn't say anything for sure. 3) They both knew the Doctor before he fled his home planet, and have a history with him. But there's very little in the way of facts about that history. For the Chief, most of it comes from a brief conversation he has with the Doctor in episode 8 that establishes that "we were both Time Lords and we both decided to leave our race," and not much else. Much is hinted, and little is actually said out loud. He seems to treat the Doctor as a slightly older, more experienced person, which would fit with the big brother vs. little brother dynamic of the Doctor and the Master. But because he's killed off before the Time Lords arrive, there's no further elaboration about their relationship. 4) This, though, justifies the debate: The War Chief's behavior in "The War Games" is almost point-for-point the way the Master acts in a typical Third Doctor-era episode. Motivated by dreams of power, he allies himself with a group of evil aliens but secretly plans to betray them as soon as he gets the upper hand. That also describes the Master in "Terror of the Autons," "The Claws of Axos," and "Frontier in Space." Another similarity: The Chief doesn't really care about the suffering he causes ordinary humans, but he does develop a personal antipathy for one of his fellow villains, the Security Chief. The grudge he nurses is the same kind of petty, personal hatred the Master has for the Doctor. So it's easy enough to imagine a scene that fits somewhere in episode 9 or 10: The War Chief's seemingly dead body, forgotten in a corner as the War Lords run in terror to escape from the Time Lords, suddenly begins to blur. There's a flash of light. Roger Delgado gets up, wearing Edward Brayshaw's clothes, and sneaks away to his own TARDIS, plotting revenge. He doesn't have much of a plan yet. Just one word: Plastics. But back to the story at hand. The Doctor shuts down the War Lords without too much trouble, but there are hints of what his real problem is going to be as early as the seventh episode, when he frets that he can't reprogram all the brainwashed soldiers quickly enough. When he does put a final stop to the War Zones, he discovers that he has no way to bring the kidnapped soldiers back to their own time periods: All the aliens' SIDRATs are broken, and his own TARDIS is only good for random jaunts through time and space—he can't pilot it well enough on his own. Stopping a science-fiction menace is no problem; what the Doctor can't deal with is a return to reality. (I can sympathize.) He's forced to call in the help of the Time Lords, the people he's been on the run from since before the series began. And as a frighteningly eerie wind heralds their arrival, the Doctor grabs Jamie and Zoe and tries to make a run for it. It's a doomed effort. For the first time, the Doctor loses. And who are these guys, anyway? Well, we learn a lot about them even before they appear on screen, during the attempted getaway. They have godlike powers, says the Doctor: "An immensely civilized race. We can control our own environment, we can live forever, barring accidents, and we have the secret of space-time travel." We also find out for the first time exactly why the Doctor ran away, and what the crime was that made him a fugitive: "I was bored." For all their powers, he complains, the Time Lords never like to actually visit any of the places they look at. The Doctor wanted to get out of the TARDIS and look around a little. You know, get some postcards, have your picture taken in front of the Eiffel Tower, the whole tourist bit. So essentially, he's running away because running away is a crime, and is a wanted fugitive who's wanted because he's a fugitive. And what's wrong with that, asks Jamie? "Well," says Troughton with dry understatement, "I do tend to get involved with things." And the Time Lords' official position on non-interference makes Star Trek's Prime Directive look like amateur hour. "The War Games" doesn't resolve neatly or satisfyingly, very much on purpose—instead, it ends with a stunning defeat in which the Doctor loses his friends, his freedom, and even his life, since his forced regeneration is essentially a death sentence. (Although the seriousness of it is downplayed both by the Time Lords, who call it merely a change in appearance, and by the Doctor himself, who is more concerned about what he's going to look like than anything else.) It's a bleak and shocking ending, but it's ameliorated by the fact that it also wasn't an ending at all: The producers knew for a fact the show was coming back for a seventh season, and since co-scriptwriter Dicks was also the script editor in charge of the overall series, he could use "The War Games" to set that seventh season in motion. He knew he could break the Doctor, because he knew he'd be fixing him later; the humiliation of Two was necessary to establish the bitterness and anger that partly motivated Three. (Or as Tom Baker's Doctor would say when his time came to die: "It's the end, but the moment has been prepared for.") Whether or not the Second Doctor's story really comes to close here is a debatable point, thanks to events that happened after this show was made, and I'm getting to that—but it's worth keeping in that at the time, "The War Games" was meant as the definitive end of this version of the Doctor, because the next version doesn't make sense without it. As part of the Doctor's sentence, Jamie and Zoe are returned to their own times just as the War Zone soldiers were, with their memories erased of all but their first meeting with the Doctor. In Jamie's case, that means nearly three years' worth of travels, and a much wider perspective on life than a Scottish highlander from 1746 could ever have gotten on his own. It's not quite as tragic as Donna Noble needing to forget everything she learned so her brain doesn't melt, but it's still a cruel blow, and it's only softened a bit by showing us their first moment back in their own times. Zoe will be just fine: Slightly amnesiac, she arrives back on her space-station home and is met by a friend. Jamie is also back in his own element, but that's a bit worrying, though the scene plays as comic: He drops down right in front of an English soldier, and the two of them immediately try to kill each other. The Doctor laughs about it, but it's a discordant note in a story about trying to stop guys like these from slaughtering each other. But let's back up a few minutes to the Doctor's trial, which like his conversation with the War Chief is particularly interesting because it hints at more than it actually says outright. What is the trial actually about? The Time Lords put the Doctor on trial for meddling in history. His defense is little more than a few sentences about fighting evil and a slideshow of the Daleks and a few of his other monster foes. His judges acquiesce so quickly that it's almost suspicious—as if they never really thought he'd committed a crime, but were going through the motions of a trial to make it look like they did. Especially since their verdict is that he should continue meddling. They don't want him to stop, they just want him to meddle more effectively: Being forced to stay in one time and place, protecting the vulnerable Earth from aliens. What they're really doing is demanding a change in format—the format that the real-life producers have been preparing to switch to for the better part of a year. The very idea that you can meddle in history is something Doctor Who wasn't always sure about: In "The Aztecs," the First Doctor warns that "you can't change history—not one line!" But that's not a sustainable idea for an ongoing series—stories are about change, so if you can't change history you've got no show. "The War Games" just makes this idea overt. The War Zones, disrupting the established order of time, show the dark side of what the Doctor does all the time, and raise the question of whether the Doctor has the right to meddle in history. And because the show isn't being cancelled, and because it's the right answer, the Time Lords lay down the verdict that allows the Doctor to keep doing what he's supposed to be doing. It won't be until much later that Doctor Who will raise more nuanced questions about meddling, and show us times he's made things worse. There's "The Face of Evil," where the Doctor discovers that he's accidentally created an insane godlike computer that's warped the civilization of generations of humans. Or more recently, there's Amy Pond: If he'd never met Amy, she'd have lived a normal life. Her daughter wouldn't have been kidnapped and raised to be a psychopathic assassin, and her husband wouldn't have been repeatedly killed and turned into a plastic Roman centurion. There are two more continuity-heavy questions that circle around "The War Games," and even though this article is awfully long already it's probably worth trying to tackle them now since they're probably easier to talk about here than in the context of some other serial. I'll try not to be boring. 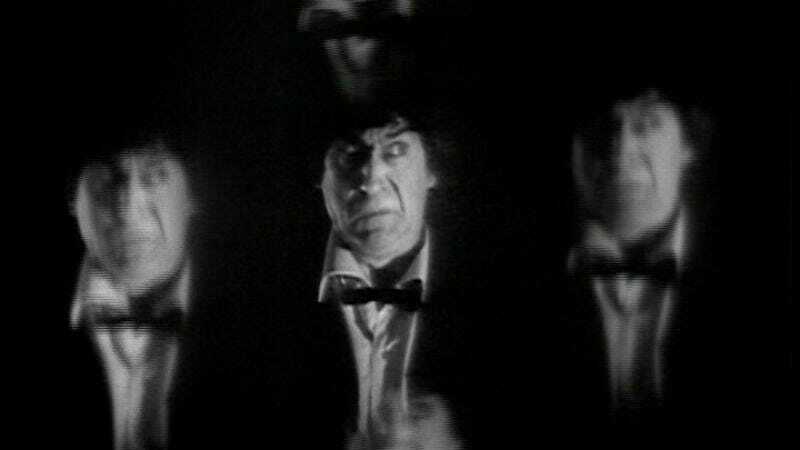 First: Is "The War Games" really the last Second Doctor story? Answer: Yes, based solely on what we see up to the middle years of the Third Doctor era. He dies, because it's part of the lesson he has to learn when he becomes Jon Pertwee. But that's a harsh fate for the main character of any story, let alone a family-friendly one like Doctor Who has (almost) always been. He's like the Velveteen Rabbit of sci-fi TV. And between a natural reaction against that, and the fan-fictiony habit of looking for "gaps" in the official TV narrative where new stories might be placed, the notion arose—I'm not sure who started it or when—that there could be a gap between Troughton's disappearance and Pertwee's arrival, a "Season 6B" between Seasons Six and Seven, during which he kept traveling the universe, but as a conscious agent of the Time Lords and not a renegade. The Season 6B concept was made even easier to accept because of Troughton's guest-starring appearances in the 10th- and 20th-anniversary specials, "The Three Doctors" and "The Five Doctors." But those also gave themselves an out, bending the rules of continuity by having the Time Lords pluck the older Doctors out of the past to help the current incarnation. 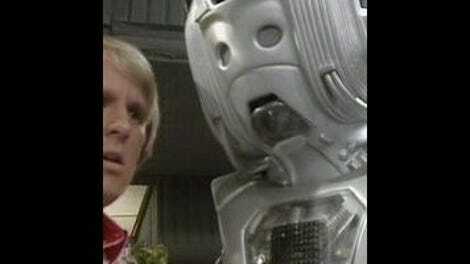 What really cemented the idea that the Second Doctor had not immediately regenerated was "The Two Doctors," a team-up with Colin Baker's Sixth Doctor in which Troughton's Doctor is visibly older (as Troughton was, of course) and has knowledge he only gained during "The War Games." When I wrote "The Two Doctors," it was no mistake that the Troughton Doctor knew he was being controlled by the Time Lords. The theory which myself and other who worked on Doctor Who began to conceive was that the Time Lords were in dual control of the TARDIS all the time. The first trial was a mockery, a public relations exercise, because the Doctor had become involved too close to home and something had to be done about him. That’s why he is almost half-hearted about attempting to escape, which normally he never was. He knew that they were in complete control and had been all along. To operate as sneakily as this, you would have to be corrupt, and that’s what came later, when I was the script editor. Did they not condemn the Doctor to exile for interfering in the affairs of other planets? And yet who had sent him on these missions? They had! So how does the story arc of Doctor Who as a series begin, seen in the new light? The First Doctor only thought he was a fugitive; instead, he was someone the Time Lords were quietly training to be their field agent. But the First Doctor is a mean, cowardly, untrustworthy old man. This raises the question of why he's been chosen in the first place, but clearly he needs to be goaded into becoming the kind of person who would meddle in history with good intentions, which is what the Time Lords want him to do. And in "An Unearthly Child," the Time Lords have placed him in 1963 London to collect two companions who will teach him by example how to do this: Ian and Barbara. The next two trips are not the random and unplanned leaps he thinks, but his first two assignments, and very important ones they are. He arrives in the Paleolithic, where he helps a group of primitive cavemen from losing the secret of fire, thus ensuring that human civilization arises. Then he is sent to Skaro to wipe out the nascent threat posed by the creatures in the mutant city while they are still weak and helpless. He has no idea at the time that he's starting the centuries-long war between his people and the Daleks that will end in the near-total destruction of them both. Maybe something worse would have happened if he hadn't been sent there that first time—maybe it had happened, and the events of "The Daleks" prevented it. Which is, according to Robert Holmes' notion, is why the "War Games" trial ended the way it did, because it was the only way it could. Because there is evil in the universe that must be fought, and the Doctor still has a part to play in that battle. • A couple other bits of "War Games" continuity that come back in the more recent seasons: First, the cube the Doctor uses to signal the Time Lords was brought back earlier this year in "The Doctor's Wife." And the punishment handed down to the War Lords, of having their planet erased from time so thoroughly "it will be as though you had never existed" seems to be exactly how the Doctor brought the Time War to an end, erasing both the Daleks and the Time Lords from history. • Next up, on Dec. 18: "The Silurians." Then "City of Death," and visits to the Fifth, Sixth, and Seventh Doctor eras.